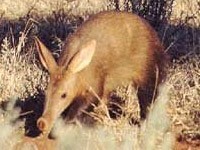 The Aardvark (Orycteropus afer) is a medium-sized, burrowing, nocturnal mammal native to Africa. It is sometimes called antbear, anteater, Cape anteater, earth hog or earth pig. The word aardvark is famous for being one of the first entries to appear in many encyclopaedias and even abridged dictionaries. 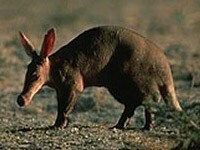 The aardvark is a little pig-like in appearance with large ears, a long snout, and sharp digging claws. 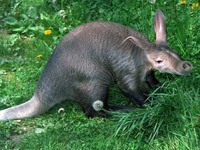 The aardvark has a long, thin, snakelike, protruding tongue and elaborate structures supporting a keen sense of smell. The average creature is 6 feet long and weighs 100 - 150 lbs. Its diet consists of ants and termites which it feeds on by locating their nests at night. 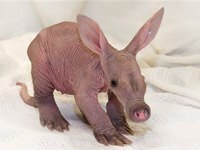 What is a young baby aardvark called? Female aardvarks typically give birth to one newborn each year. A baby aardvark is called a cub. When born a cub weighs around 2 kg. The Aardvark cub is able to leave the burrow to accompany its mother after only two weeks, and is eating termites at 14 weeks and is weaned by 16 weeks. The aardvark lives only in Africa, south of the Sahara. Their land ranges from Sudan to South Africa. They live mainly in savannas, woodlands, grassy plains, and bush country, but they prefer sandy soil. Their land preference mainly consists of availability of food. They live in two to twenty foot burrows that they dig themselves nightly. Aardvarks can dig faster than most animals, being able to dig a long burrow in just a few minutes. They keep their burrows clean. The males are mostly nomadic, the females being more territorial. Many other animals use abandoned aardvark burrows as shelters. What is the color of an aardvark? An aardvark is normally a pale yellowish gray, although it may be stained various shades of earth colors depending on the soil in which it burrows. Does an aardvark have a tongue? Yes aardvarks have tongues. An aardvark's tongue can be up to 12 inches (30.5 centimeters) long and is sticky to help extract termites from their mound. How much does an aardvark eat? An Aardvark can eat up to around 50,000 termites in one night. How far do aardvarks walk? Download free Aardvark wallpapers, click on the image to open the large version. Print free Aardvark coloring pages, click on the image to open the large version.